Join Tribewanted Monestevole Italy for a truly magical month, as you will dive deep into the practices and principles of yoga, honing your skills and understanding, as future teachers. This training is limited to just 12 participants, to ensure thorough and fully 'hands-on' learning experience for all. The training is fully accredited by the Yoga Alliance Professionals UK. 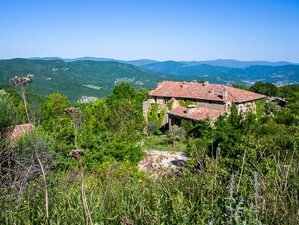 During this retreat, you will be staying at magnificent Tribewanted Monestevole, a sustainable farm, nestled deep in the Umbrian mountains, Italy. With eco-lux accommodations, stunning glass-fronted workshop space and organic, home-grown food, your home from home is a truly spectacular backdrop to your experience. A 4-person shared dorm. Tempo is a beautiful attic with four twin beds, each equipped with its own chest and curtains for privacy. A 2-person twin room. Lovingly restored and rustic. A 1 or 2 person double room. It is a master bedroom featuring beams and antique furniture. A 1 or 2 person double room with hand made furniture, warm, and cozy. This one-month course will give students a chance to immerse themselves in yoga. Students will develop their understanding and build a strong foundation in both theoretical knowledge and practical experience in order to feel confident to teach a Vinyasa yoga class at a high standard. Including how to sequence, adjustments, demonstration, adjustments, learning, through observation, teaching cues, styles, communication, sequencing Vinyasa, restorative, and level 1 class, demonstrating, qualities of a good teacher, class theme, practical teaching practice. The total hour is 70 hours. Including asanas from Ashtanga primary series, learning advanced asana, meditation, pranayama, kriyas, Sanskrit, mantras, chanting, yoga Nidra. The total hour is 70 hours. Including energetic anatomy (nadis, prana, chakra, etc. ), anatomy and physiology of the body, anatomical movement, and directional language, injuries, ailments, and healing sequences health and healing. As part of the non-contact component of the course, you will be required to complete an Online Anatomy Training, and to submit your certificate of completion. Full details will be given when you register for the course. The total hour is 10 hours. Including building your business, tools you will need, marketing yourself as a teacher, ethics, and professionalism, finding places to teach, organizing classes, workshops, and retreats. The total hour is 20 hours. Trainees will be able to lead a Vinyasa yoga class to all levels of the group to feel confident in both delivering the class and making adjustments and modifications. Trainees will feel confident developing their own sequence and how to modify a class to meet all students needs. Trainees will develop their own practice and have a solid understanding of how to teach asana, pranayama, meditation, bandhas, and dristhi. Trainees will be knowledgeable about the history and philosophy of yoga, with a strong focus on Ashtanga Vinyasa yoga. Trainees will have a good understanding of the business of yoga teaching. This course has met the stringent requirements set by Yoga Alliance Professionals, demonstrating that the course is of the highest standard and that our graduates may use the title ‘Registered Yoga Teacher’ RYT as a sign of quality training when they register themselves with Yoga Alliance Professionals. The course will be taught by Erin Prichard, a SYT, who has over 7 years of teacher training experience. You will need to have a regular yoga practice (no less than 2 years) to be accepted. Track record of attending yoga classes may be required. Reference from a teacher to support your application may be requested. Erin, originally from sunny Florida, is a free-spirited barefoot enthusiast, surfer, yogini, and world adventurer. She is a senior yoga teacher and has been teaching Yogasana for over 13 years. She spreads her love of yoga to yogi’s and yogini’s in London as well as on adventurous retreats worldwide. She runs workshops in London as well as teacher training programs at Yogarise and internationally. In her teachings, you can expect a pinch of pranayama, a dash of philosophy, and a slug of meditation all mixed together with some inspiring asana. Your venue for the month is magnificent Tribewanted Monestevole, a small traditional Umbrian community living in a beautiful 15th century farm hamlet, a sustainable farm and community, nestled deep in the Umbrian mountains, Italy. With eco luxurious accommodations, a stunning glass-fronted workshop space and organic, home-grown food, your home from home is a truly spectacular backdrop to your experience. The property sits at 600 meters on top of a hill surrounded by 40 hectares of olive groves, pastures, oak forests and a vineyard. You will be served daily breakfast, lunch, and dinner. Some food is homegrown and wine is local and organic. Monestevole is a working farm with an organic veggie garden, working toward full sustainability. Meals will be vegetarian and vegan, prepared by a specialist chef from Monday to Friday. On weekends, experience authentic Umbrian cuisine, prepared by a local cook. Weekends are kept free for rest and relaxation or optional visits to nearby places of interest, such as Perugia, Gubbio, and Assisi. Outside the workshop sessions, beautiful hikes are close at hand. Relax in a hammock or swim in the saltwater pool. Esalen massage, Alchemy of Touch massage, cooking lessons, wine tasting, and horse riding are available onsite at additional charge. Take the Umbertide exit, continue through the town center and cross the bridge on the Tevere river. Follow the direction for Passignano or Preggio up the hill for eight kilometers. You will find the Tribewanted sign on your right next to the vineyard. Follow the dirt road and you will find Monestevole. Follow the direction of Castel Rigone and then Umbertide. Continue for about 10 kilometers and you will find the Tribewanted sign on your left. Follow the dirt road and you will find the place. Please book your flight to arrive at Perugia San Francesco d'Assisi - Umbria International Airport (PEG). This airport is located 30 minutes away from Monestevole. Flights from London Stansted (RyanAir) are available Monday, Wednesday, Friday and Sunday, starting at 20 GBP each way. Flights are also available from Milan and Rome. Monestevole can arrange a transfer to Monestevole from the airport for 60 EUR each way (up to four people). The closest train stations are Perugia San Giovanni if you depart from Rome or Terontola-Cortona sul Trasimeno if you depart from Florence. Both are 30 minutes away and connect to the fast speed trains in Rome and Florence. Monestevole can arrange a transfer to Monestevole from the train station for 60 EUR each way (up to four people). Airport: Perugia San Francesco d'Assisi – Umbria International Airport Airport transfer available: Perugia San Francesco d'Assisi – Umbria International Airport (US$67 per person) Additional charges may apply. You can request this in the next step. The rest of the payment should be paid 75 days before arrival. Tribewanted Monestevole Italy is a sustainable community, offering beautiful accommodations and interesting positive activities for a better life.